Time to #GetGrilling, everyone! It’s finally warm again! Hurrah! And maybe while you’re at it, win something too!? We love working with the awesome, porktastic folks at Smithfield because, well, bacon, and because they’re always giving great stuff away and inviting us to share the opportunity with you! So now that there aren’t snowflakes in the weather forecast (though we wouldn’t put it past Mother Nature to throw us one final frosty curveball for the year), it’s time to light up those grills, invite over your friends and get grilling. Or even better, get out to the baseball stadium or NASCAR race parking lot and GET.GRILLING! Grilling + Tailgating = Life. One of the most quintessential things we love to serve up fresh off the grill are ribs. Fall of the bone, tasty and mouth-watering ribs. Ribs are absolutely a must-have at every tailgate and Smithfield Extra Tender Back Ribs are our go-to because they are high-quality, hand-trimmed, and made from 100% fresh pork. We cooked up these tasty ribs, which we call our Peanut Maple Bourbon Sweet & Savory Pork Ribs, special for this weekend’s Toyota Owners 400 NASCAR Race! This Saturday, April 13th, it’s goin’ down at Richmond Raceway, kicking off the Spring Tailgate Season, Virginia-style. (It certainly doesn’t hurt that UVA just won the National Championship either so we expect this weekend it’ll be going ooooffff in Richmond)! So in celebration, we thought we’d take 2 quintessential, culinary exports of the great state of Virginia—one you know and one you maybe didn’t know you knew—to flavor our weekend tailgate’s ribs. Virginia has been growing peanuts since the earliest European settlers arrived in the region. Originating in South America, peanuts arrived in North America via a circuitous route through Europe and Virginia grew its first commercial peanut crops in Sussex County in the 1840s. Today, Virginia is still a peanut powerhouse, known for its large and flavorful peanuts. You’ll find the majority of its crops in the southeast area of the Commonwealth. Did You Know: Maple Syrup Comes from Virginia Too! Virginia’s likely not the first place you think of when you think of maple syrup. (Places like Quebec, Canada or Vermont most immediately come to mind). But believe it or not, Virginia makes some pretty good maple syrup too at a variety of sugar camps in Highland County, which is located deep in the Blue Ridge Mountains. In fact, should you feel inclined to learn more, you might consider visiting the county’s annual Maple Festival that draws thousands of visitors to the area! So we took our Virginia inspiration and came up with this recipe, which we highly recommend for this weekend’s Richmond Raceway tailgate our your backyard watch party. Thankfully the good folks at Smithfield sent us three whole racks so we’ll be chowing down like oinksters as we cheer on the No. 10 driver, Aric Almirola. Now that you’ve got the recipe, how do you win cool stuff? Easy! 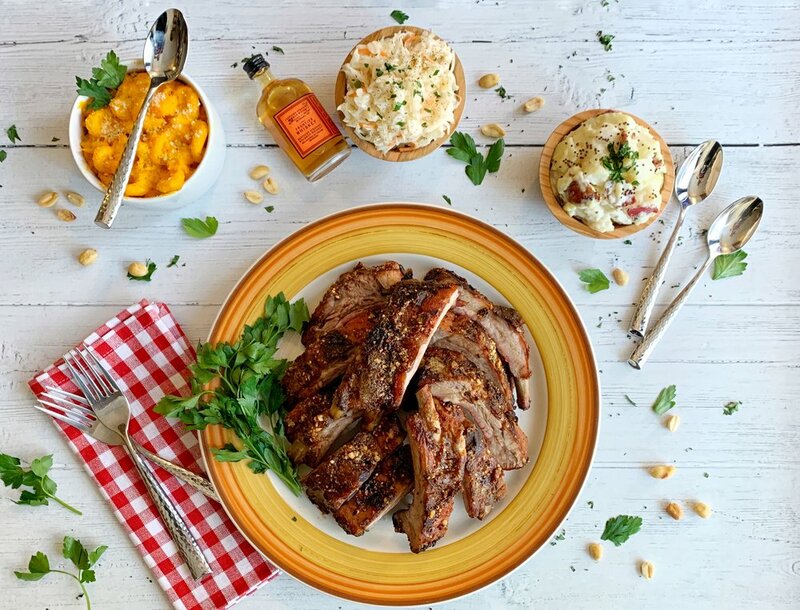 Smithfield and Walmart have teamed up to encourage you be a backyard barbecuer this summer! So as part of their #SmithfieldGetGrilling Sweepstakes, you can fill out an entry form and take a brief quiz, which will enter you to become one of two grand prize winners. Each will receive a $500 Walmart gift card! And if you aren’t one of the lucky two, no worries! There will be 50 first prize winners too and they will each receive a $50 Walmart gift card. (We don’t know about you, but we can do a lot of damage at Walmart with $50)! So find out if you’re #Team Fast or #TeamSlow and enter to win! *Note: Entries will be received April 12 through September 2, 2019. 🛒 You can pick up as many racks as your heart desires of these Smithfield Extra Tender Fresh Pork Ribs at Walmart and get grilling all spring and summer long. ℹ️ For more grilling tips and recipe inspiration, visit www.SmithfieldGetGrilling.com. And if you make these ribs, be sure to snap a photo and share it with us either via email (hello@hungryfan.com) or on Instagram. Use #HungryFanFood or DM us!